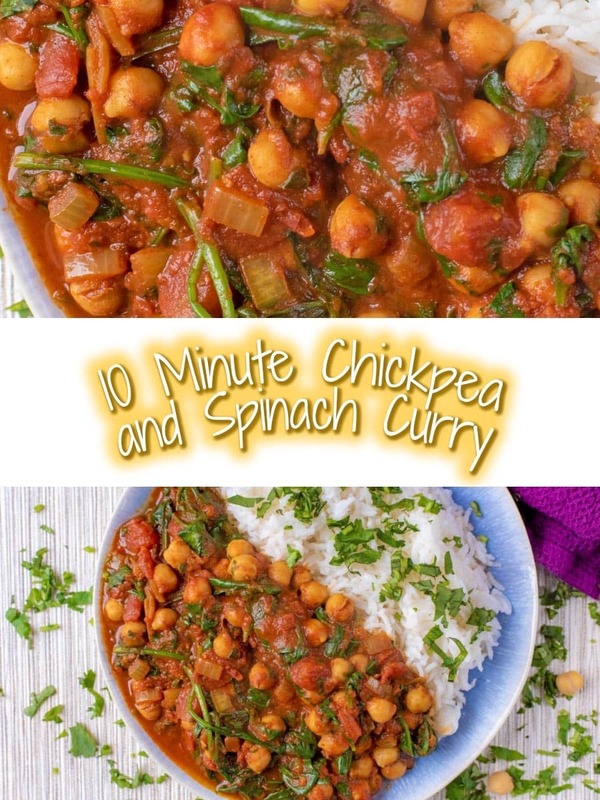 10 Minute Chickpea and Spinach Curry - quick, easy and full of flavour. 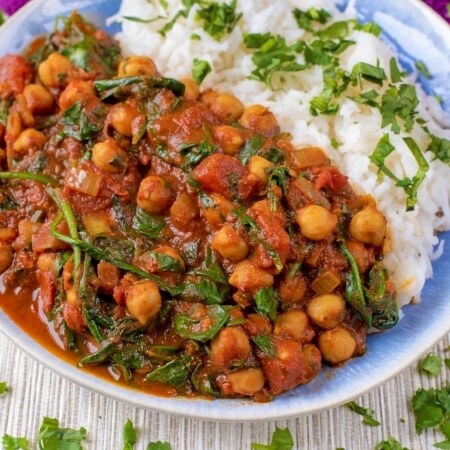 This 10 Minute Chickpea and Spinach Curry is an easy vegan curry that you need in your life. It’s low in calories and fat and you just tip everything in to the pan and it’s ready less than 10 minutes later. Bursting with iron rich spinach and protein packed chickpeas, this curry freezes well and it’s easy to adapt. What we love about this curry, apart from the super quick cook time, is how little preparation is required – it basically makes itself. If you are tempted to order a curry, try making this in less time than it would take you to look at the menu. Not only is it quick with very little prep, but it’s made with ingredients you most likely have in your kitchen anyway. The ultimate cupboard raid meal. You just add a can of chickpeas and a can of tomatoes to onion, garlic and spices and simmer and then stir in spinach and herbs before serving. Even the most novice cooks can manage that! 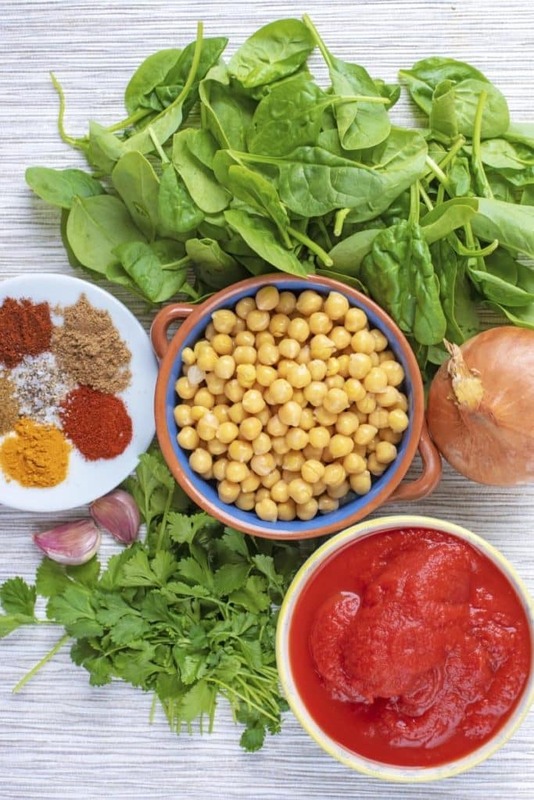 We are big into our herbs and spices, as they can transform the simplest of ingredients, like spinach and chickpeas, into something much more exciting. They add a tonne of flavour, without adding a lot of extra calories and this curry is just 123 calories per portion. That is a low calorie chickpea curry! This is a super healthy chickpea curry too, with all the spinach added. It’s also a low fat chickpea curry, with just 1 gram of fat per portion, so it’s great if you’re looking for a Slimming World Curry or a Weight Watchers Curry. If want to make it a little more indulgent, a little cream, crème fraîche or coconut milk goes a long way in this spinach and chickpea curry. 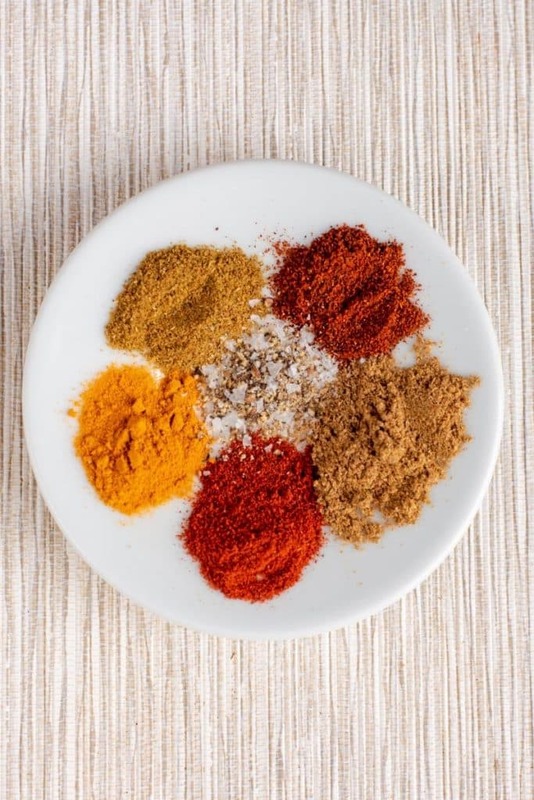 What spices do I need to make a curry? The most used spices in our kitchen, which feature in this dish, are ground coriander, cumin, paprika, salt and pepper, turmeric and of course chilli flakes/powder because they are flavour packed. You can pick spices up for really cheap, especially if you buy them in bigger packets in ethnic stores and they really do make the dish. Don’t be afraid to start experimenting with herbs and spices. Add a little more or a little less of each depending on your tastes to make this tasty vegan chickpea curry. What vegetables can you add to curry? We only used spinach and onion in this curry to keep it quick and simple, but you can include pretty much any vegetables. Finely chop some bell peppers and mushrooms and cook at the same time as the onion or swap the spinach for some kale if you want to mix it up a bit. To give this curry a more meaty feel, you could throw some chunks of aubergine into the mix or some larger chunks of portobello mushroom. Why not skip the rice and add some good sweet potato to the curry instead? We had tinned chickpeas, we had tinned tomatoes and we had some spinach in the fridge that was starting to look a bit sorry for itself, so I thought I would throw it all together to make a curry. 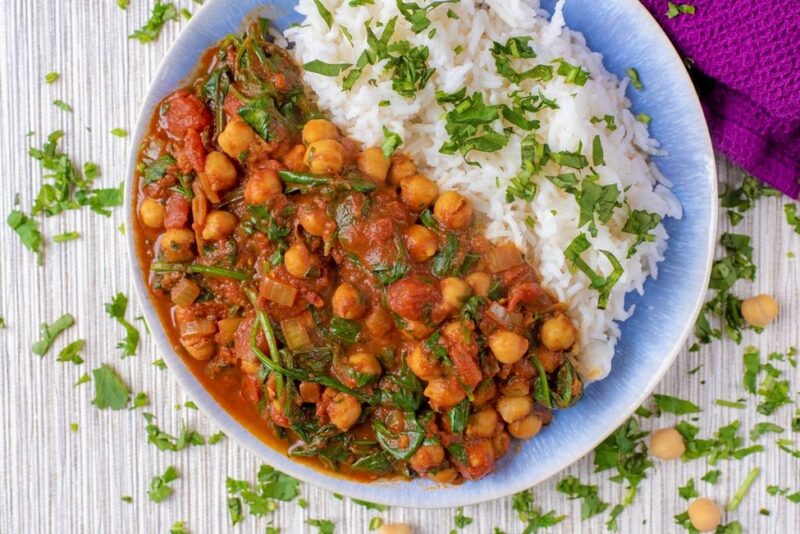 Because this 10 Minute Chickpea and Spinach Curry uses cupboard staples it is a really budget meal and hardly costs anything to make. Can You Freeze Chickpea Curry? You sure can! Separate it in to freezer containers with some rice and pop them in your freezer for a quick and easy meal. Just liven it up with some fresh herbs before serving. Of course using a slow cooker is going to mean your meal takes longer than 10 minutes to cook, but there is still very little prep. Simply follow step one and two as below and then put everything expect the spinach and herbs in the slow cooker and cook on high for 2 and a half hours. 30 minutes before serving, stir in the spinach and coriander. One: Heat a little oil in a large pan and add the onion and garlic and cook for 2 minutes. Two: Add the spices and stir well. Three: Add the chopped tomatoes, drained chickpeas and salt and pepper and simmer for 8 minutes. Four: 2 minutes before it has finished cooking, add the spinach and coriander and stir well. If you don’t have a can of chickpeas, then any other can of plain beans will work. We like chickpeas because they are really creamy, but others work too. Don’t have any spinach? You can use another leafy green instead. Kale, Cabbage and Swiss chard will all work, but they will take a little bit longer to cook, so put them in the pan earlier. Creamy curries are super comforting, so why not add a spoonful of cream, coconut milk or creme fraiche to the pan just before serving. Instead of serving this spinach curry with plain rice, mix some lime juice and fresh coriander in to the rice before serving. A little tip about tinned tomatoes – we always use whole tomatoes and chop them up in the pan with a wooden spoon as they are less processed. Chopped tomatoes tend to be really watery too. Try to buy the best quality too, as you can really taste the difference. 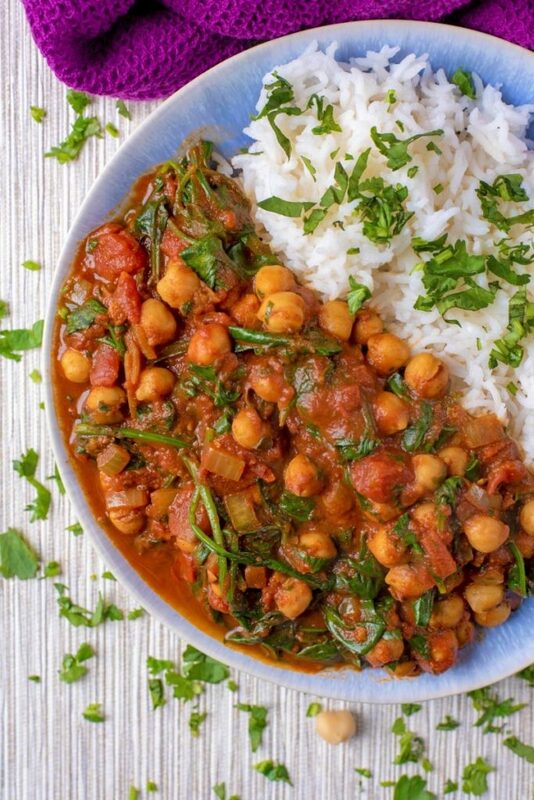 Do you want to be kept up to date on more delicious posts like this 10 Minute Chickpea and Spinach Curry? Please subscribe to the blog mailing list (it takes 30 seconds). If you’ve tried this 10 Chickpea Curry or any other recipe on the blog then let us know how you got on in the comments below, we love hearing from you! You can also FOLLOW US on FACEBOOK, TWITTER, INSTAGRAM and PINTEREST to see more delicious recipe ideas, behind the scenes shots and also what we are getting up to. Curries don’t get much quicker and easier than this 10 Minute Chickpea and Spinach Curry. Just tip everything in to the pan and it’s ready less than 10 minutes later. Heat a little oil in a large pan and add the onion and garlic and cook for 2 minutes. 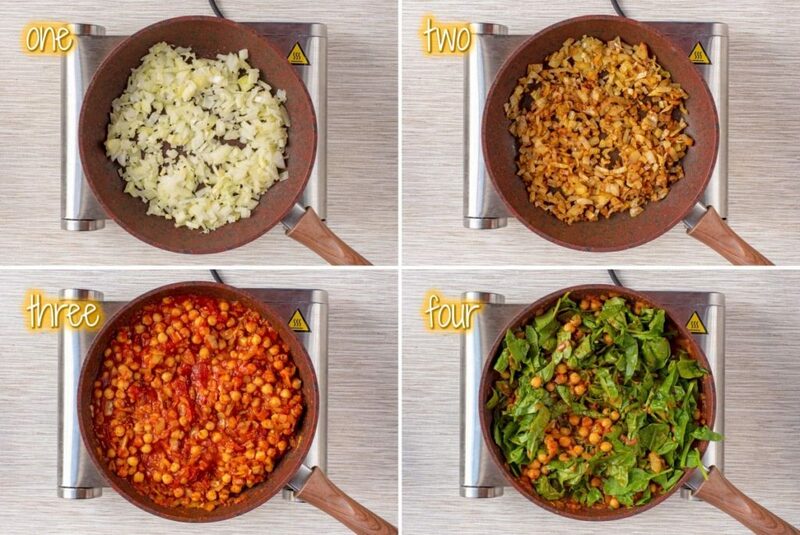 Add the chopped tomatoes, drained chickpeas and salt and pepper. Simmer for 8 minutes. If you don't have a can of chickpeas, then any other can of plain beans will work. We like chickpeas because they are really creamy, but others work too. Don't have any spinach? You can use another leafy green instead. Kale, Cabbage and Swiss chard will all work, but they will take a little bit longer to cook, so put them in the pan earlier. A little tip about tinned tomatoes - we always use whole tomatoes and chop them up in the pan with a wooden pan as they are less processed. Chopped tomatoes tend to be really watery too. Try to buy the best quality too, as you can really taste the difference. Made this for me and my boyfriend and it’s delicious. We doubled the amount of all ingredients and after we both had a bowl this size we had a little more than half of the pan left. We ended up adding curry powder as well for more flavour. I love this recipe! It’s so easy, but has so much great flavor! So healthy and delicious! Thank you for sharing the recipe! I can’t believe this curry can be made in under 10 minutes! I have to check it now 🙂 because curries always take me A LOT of time to make. And the fact that there is plenty of spinach just makes this recipe a great find – thank you! I love the looks of this dish! we’ve been making more curry here lately so will have to give it a try soon! you had me at 10 minutes! what a flavor packed delicious recipe this is! chickpeas are one of my favorite things to eat. loving this lightened up version. Recipe didn’t do it for me. Why are people that have not cooked it rating it? Sorry you didn’t enjoy it. Can I ask what it is about it that didn’t do it for you? As you can see, lots of people have cooked it and enjoyed it.